$$$ Ultra Collection: The latest designs by the top names in fashion, such as Michael Kors, Ike Behar and Allure Men. Made with lightweight, breathable and ultra luxurious fabrics such as the super 140’s merino wool. This collection offers a variety of colors, including Cobalt, Burgundy, Granite, Shale, Sandstone, Cement, Onyx, Chrome, Checked, Plaid, Navy, Grey and Black. These formalwear options have a tailored fit – shorter lengths, higher armholes, slim lapels, narrow sleeves and an unforgettable look. $$ Luxury & Fashion Collections: Designers from our these collections include Allure Men, Ralph Lauren, Savvi, Lord West, and Red Sleeve. Made with luxurious fabrics such as the super 100’s tropical wool blend fabric. Enjoy a flattering look with a comfortable fit and a variety of colors to choose from, including Grey, Slate Blue, Tan, Red, Black, White, Brown, Navy, Heather Grey and Steel Grey. $ Classic Collection: Our Classic collection features tuxedos designed by Erik Lawrence. 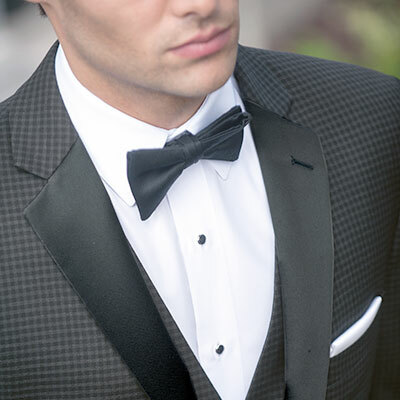 Choose from an assortment of classic fitting tuxedos and dress suits made from elegant fabrics. Colors Include Black, White and Ivory. This price point is perfect when you’re looking for a sharp, classic looking tuxedo rental and don’t want to break the bank! Pricing varies per location. We encourage you to contact the store directly for specific price points. General price quotes are assumed to be complete tuxedo rentals. These include coat, trouser, dress shirt, vest or cummerbund, tie, shoes, shirt studs, cuff links and a pocket square. Special discounts are available for large groups, such as wedding parties, quinceaneras and corporate events. Accessory upgrades are available and may not be included in the quoted price. Unless otherwise stated, it is assumed you are requesting a price quote for one single rental. Orders made within seven days of your event are eligible for a $25 OFF discount only. If you find the same tuxedo or suit rental for a cheaper rate elsewhere, we will match the price!